OSE assembled 3/16" (.187) Flex cable with 3/16" (.187" 4.75mm) diameter propeller shaft. For use with 3/16" propellers and struts with 3/16" (.187) bushings or bearings. 18", 24" or 30" total assembled length. NOTE: Flex cable lengths are from tip of shaft to end of cable. Example, 24" cable is aprox 21" of cable and 3.125" of prop shaft. Lengths are approximate and can be plus or minus one half inch. These require the customer to cut these to their required length. 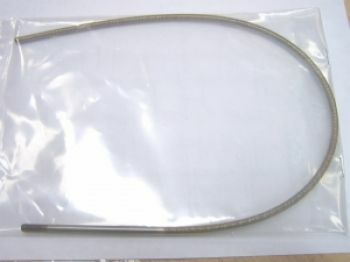 .187" (4.74mm) diameter flex cable.